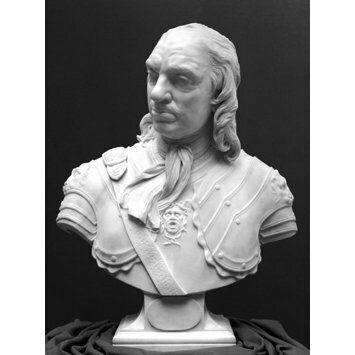 Oliver Cromwell (1599-1658) was often represented in 18th-century British sculpture because of his central role in British history. This bust is probably based on a plaster cast of his face, made for his funeral effigy. It also shows Wilton's interest in and understanding of ancient Roman sculpture, which he had studied in Italy. Joseph Wilton was born in London, but trained in the Netherlands, France and Italy from 1744 to 1755. He was appointed Statuary to His Majesty George III in 1761, and in 1768 became a founder member of the Royal Academy. However in the same year he inherited a large legacy from his father and neglected sculpture thereafter; he went bankrupt in 1793. The sitter, who wears a cuirass, adorned with lions in relief on the shoulders and a Medusa head on the breast, turned his hand sharply to the right. His thinning hair falls in curls to his shoulder. Purchased by the Museum from Alfred Spero, London, in 1930, for £70. 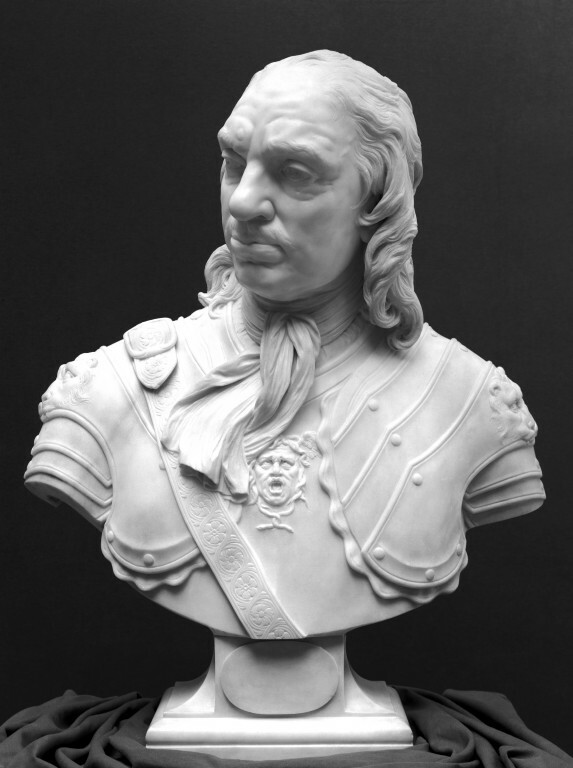 Wilson, D. A bust of Thomas Hollis by Joseph Wilton RA: Sitter and artist revisited. The British Art Journal. V. no. 3. Winter 2004. pp. 17, 19. Bilbey, Diane and Trusted Marjorie. British Sculpture 1470 to 2000. A Concise Catalogue of the Collection at the Victoria and Albert Museum. London, 2002. p. p. 163-4. cat. no. 220. Wilson, D. The rediscovered Mr Gladstone goes home. A bust of the stateman by Joseph Edgar Boehm. The British Art Journal. VII. no. 3. note. 34 on p. 27. The Cromwell Museum in Huntingdon. Huntingdon, 1965. p. 3. cat. no. 13.